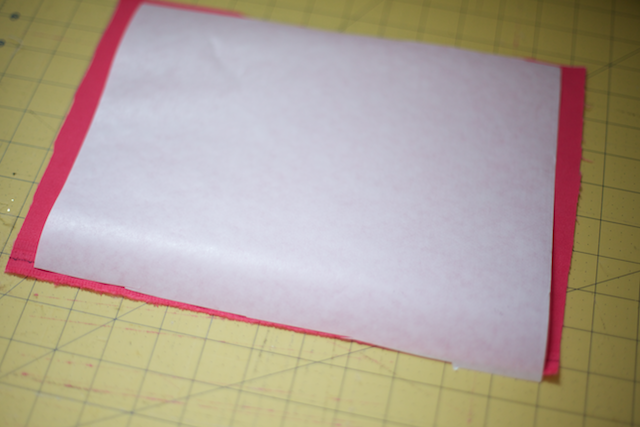 Cut a 34" x 17" rectangle and fold it in half with wrong sides facing. Pin up the two sides. 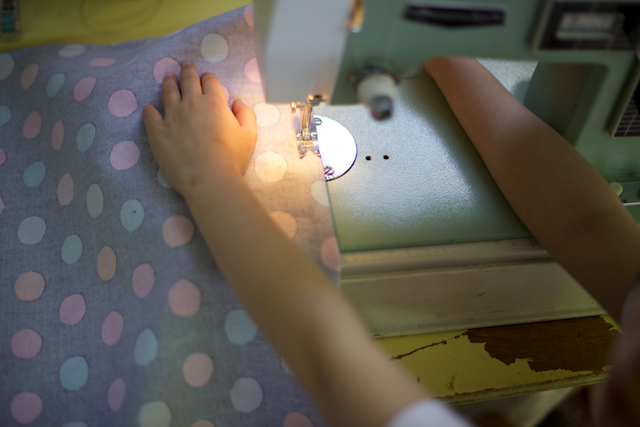 Turn inside-out and iron (or finger press) the seams. 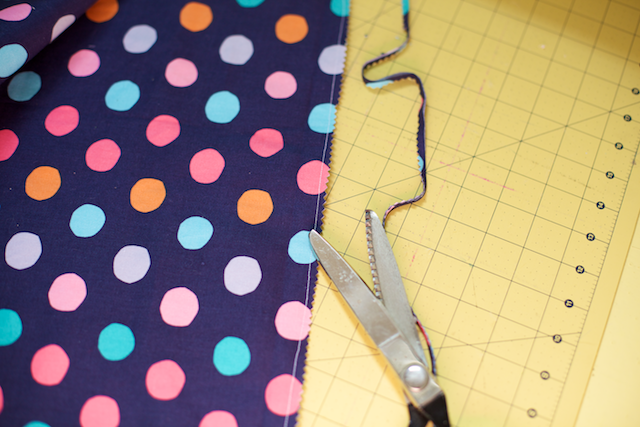 Sew along the side seams while still inside-out. 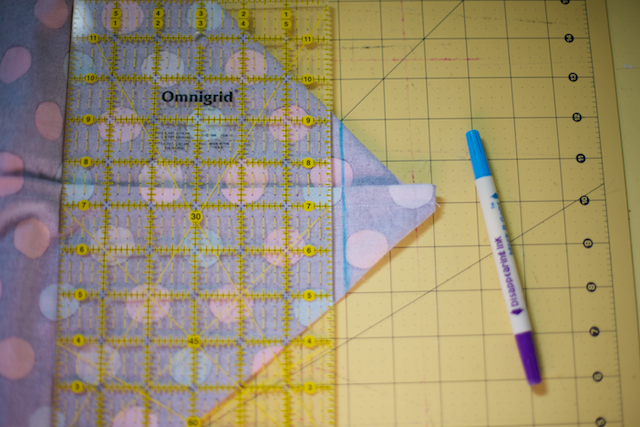 Fold the bag on its side and use your ruler mat to mark off a straight line about 2'' from each corner of the bottom. 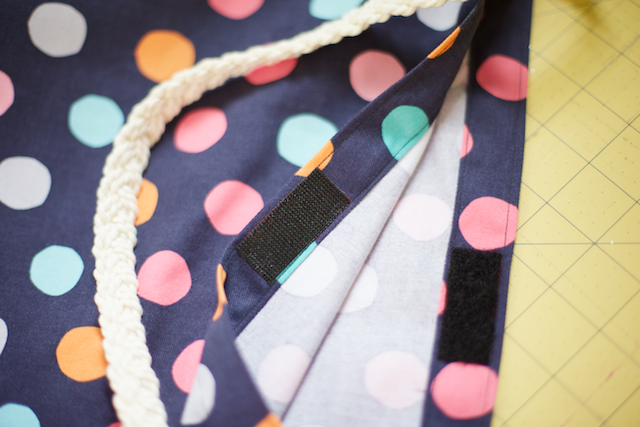 Sew along line(s). 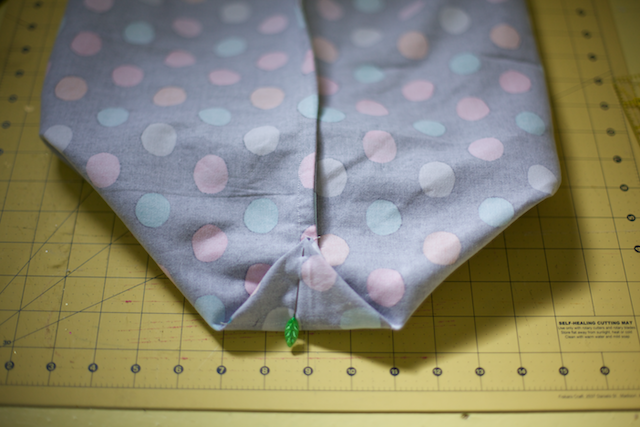 Pin the corner up onto the side seam and give it a stitch to keep it from flopping around. 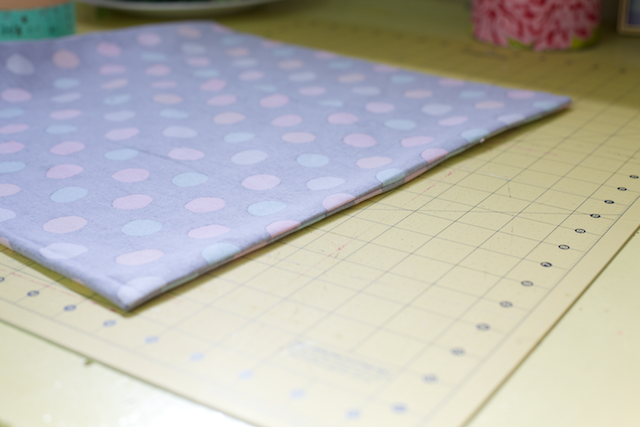 Fold the top under about 1'' twice and sew all the way around the top and bottom of the folded edge. 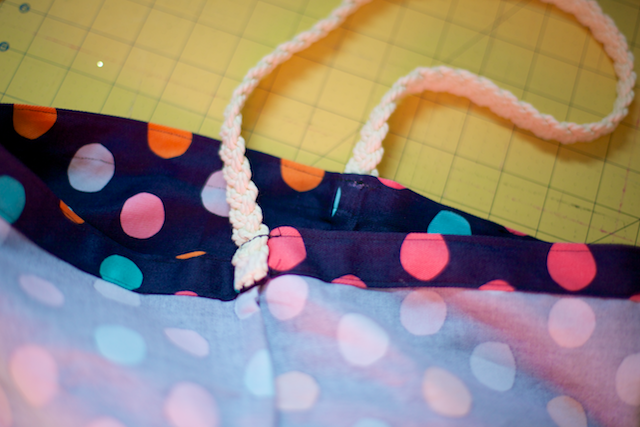 Sew on each end of a 24'' length of braided rope trim. Add a bit of stick-on velcro. 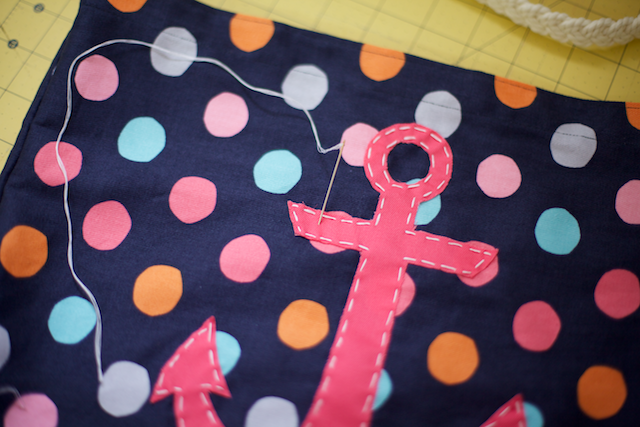 Add an anchor by cutting an 8'' x 11'' piece of coordinating fabric and paper-backed fusible web. 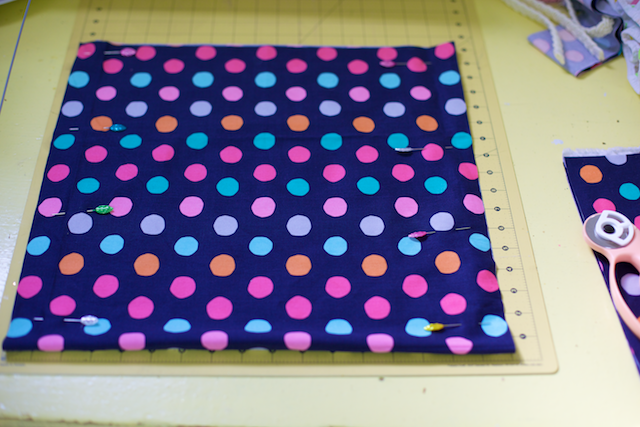 Iron the fusible web to the back of the fabric piece. 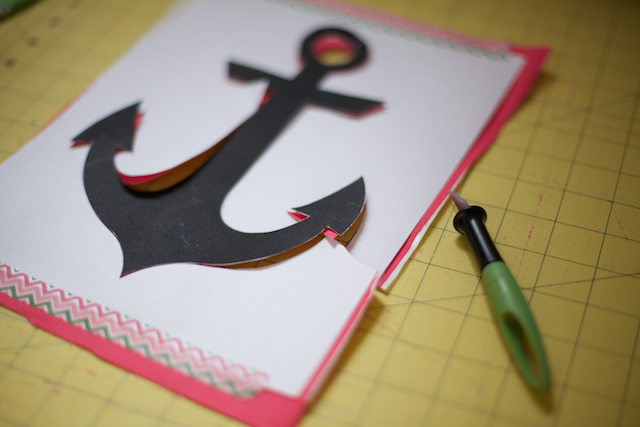 Print out an anchor graphic (just google "anchor graphic") and use a craft knife to cut it out. Peel off the paper backing and iron to the front of the back. Finish off with contrasting white stitches. I have to say, making something is the perfect way to start off my happy month. 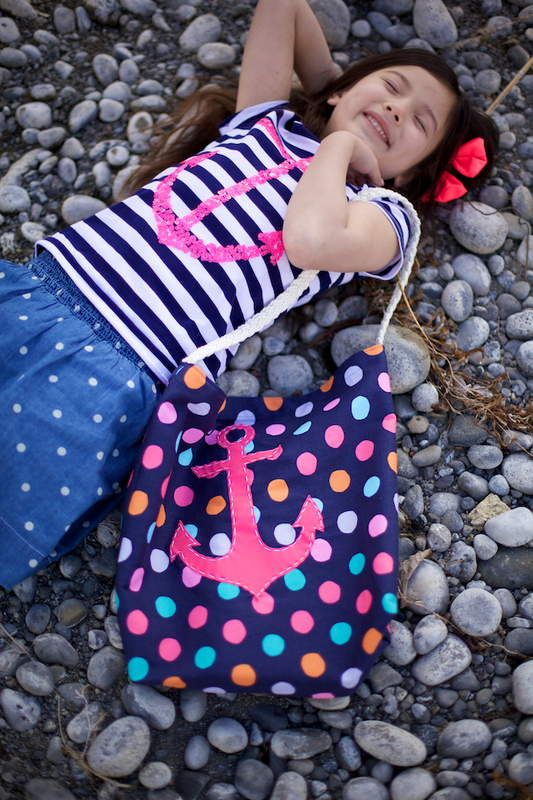 Especially something with polka dots and a pink anchor. I mean that's bliss. 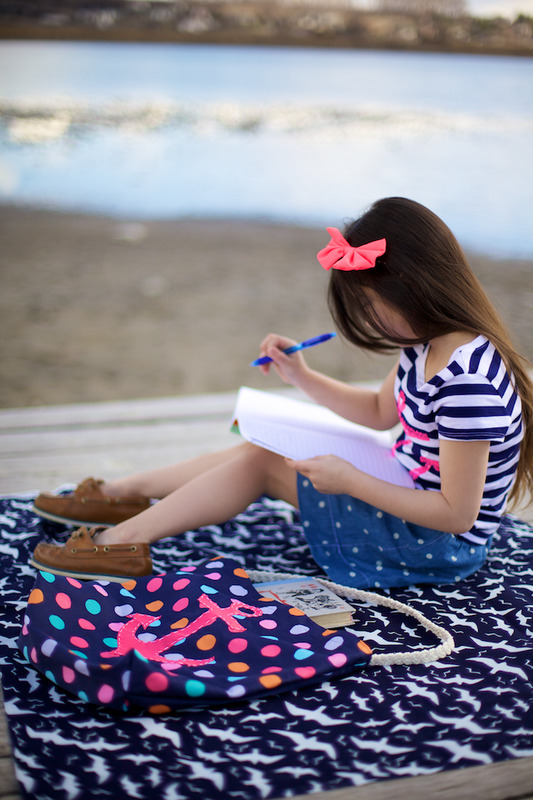 Sometimes I get lazy or busy and don't make time to be creative and I really think it affects my attitude! I think creating things is a basic need for humans. 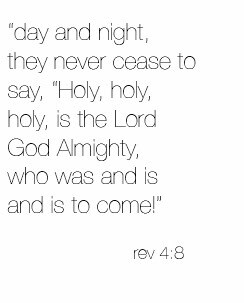 Like eating or praying or sleeping. I also think that some people need a little more than others (raises hand) so when we get time to create something it makes us really happy! :O) I think I'm gonna do it again today. 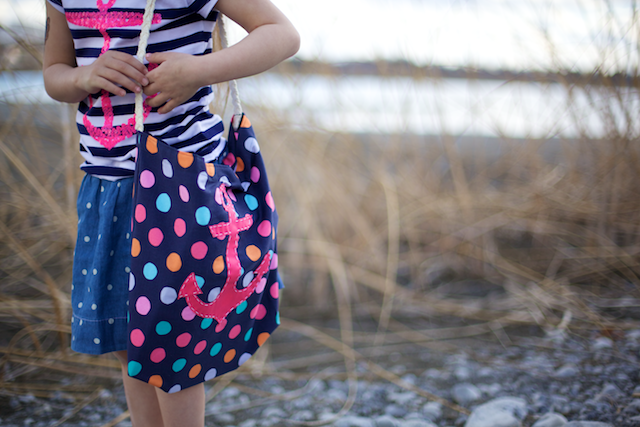 Such a cute bag! 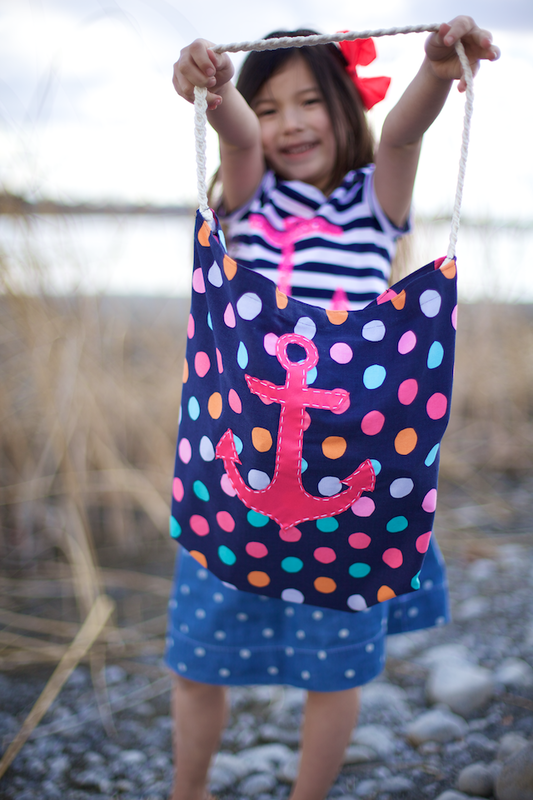 I love the combination of the polka dots with the anchor - definitely the kind of bag I want to be carrying around this spring. Love it! You give perfect instructions, even I can follow them! Thanks for another great post and tutorial, love you and your cute girl! 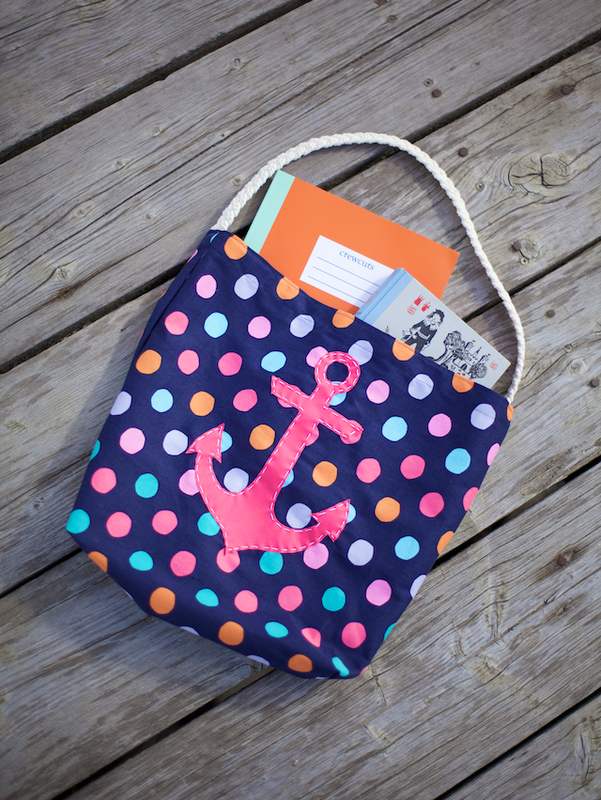 Seriously, I never make anything and I am determined to make this bag. P.s. I remember a past post about people being horrible...they are just jealous of you and your awesomeness. This is so cute!! 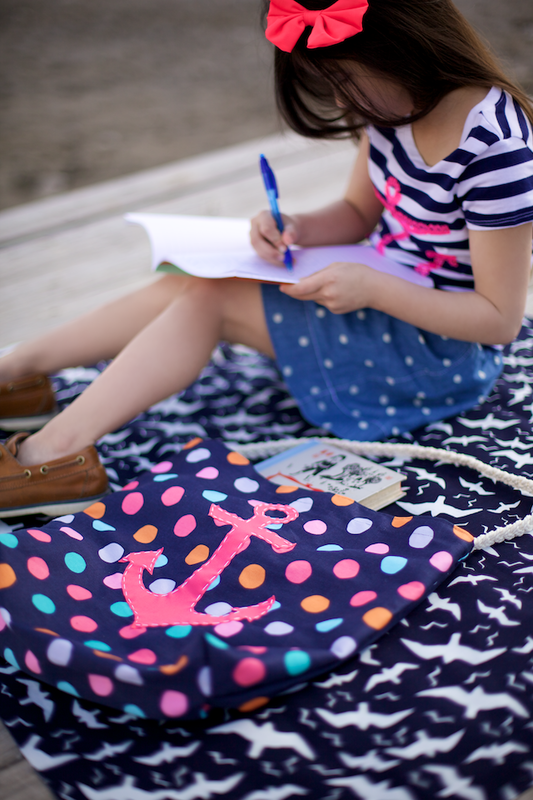 And I looooove that seagulls fabric too. 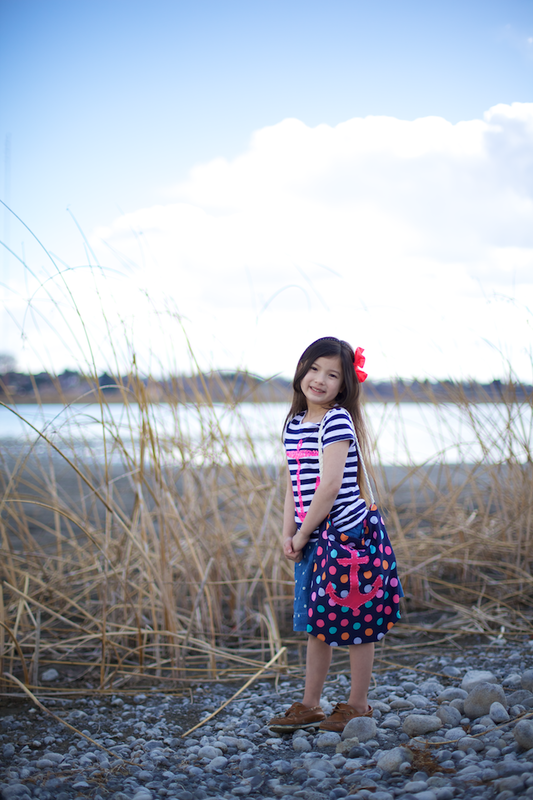 I'm pretty impressed also with Paige' s warm weather duds....hoping it gets warm enough for that soon! Your comment about the need to create reminded me of one of my favorite quotes! Hopefully you'll love it too! A few days ago, in my Physics class at school we were talking about inventions, innovations, and the characteristics of a creative person. Some of these were open-mindedness and willingness to take risks, which people can develop. Also, just because somebody doesn't have all the characteristics doesn't mean they aren't creative. The point was that pretty much everyone has creative potential.